Ladewig, Silva H. (forthcoming). Integrating Gestures – cognitive grammar multimodal. De Gruyter Mouton (Series Applications of Cognitive Linguistics (ACL)). Ladewig, Silva H. (2014). Creating multimodal utterances. The linear integration of gestures into speech. In: Cornelia Müller, Alan Cienki, Ellen Fricke, Silva H. Ladewig, David McNeill & Jana Bressem (eds. 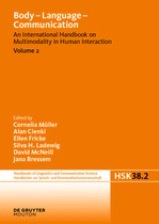 ), Body-Language-Communication: An International Handbook on Multimodality in Human Interaction. (Handbooks of Linguistics and Communication Science 38.2.) Berlin, Boston: De Gruyter: Mouton, 1662- 1677. 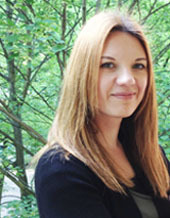 Ladewig, Silva H. (2012). Syntactic and semantic integration of gestures into speech – Structural, cognitive, and conceptual aspects. PhD thesis, European University Viadrina, Frankfurt (Oder). Ladewig, Silva H. (in preparation). From movement to linguistic structure. Processes of grammaticalization and semanticization in gesture. Habilitation project. Ladewig, Silva H. (in preparation). Recurrent gestures. In: Alan Cienki (ed.) The Cambridge Handbook of Gesture Studies. Harrison, Simon, Silva H. Ladewig & Jana Bressem (eds. ), The diversity of recurrency: Recurrent gesture cross-linguistically, wird eingereicht bei Gesture. Hirrel, Laura & Silva H. Ladewig (in preparation). The embodied nature of aspect – a cross-linguistic comparison of the cyclic gesture in English, Farsi, and German, in Harrison, Simon, Silva H. Ladewig & Jana Bressem (eds. ), The diversity of recurrency: Recurrent gesture cross-linguistically. Special Issue of Gesture. Ladewig, Silva H. (2014). Recurrent gestures. In: Cornelia Müller, Alan Cienki, Ellen Fricke, Silva H. Ladewig, David McNeill & Jana Bressem (eds. ), Body-Language-Communication: An International Hand book on Multimodality in Human Interaction. (Handbooks of Linguistics and Communication Science 38.2.) Berlin, Boston: De Gruyter: Mouton, 1558- 1575. Ladewig, Silva H. (2014). The cyclic gesture. In: Cornelia Müller, Alan Cienki, Ellen Fricke, Silva H. Ladewig, David McNeill & Jana Bressem (eds. ), Body-Language-Communication: An International Handbook on Multimodality in Human Interaction. (Handbooks of Linguistics and Communication Science 38.2.) Berlin, Boston: De Gruyter: Mouton, 1605- 1618. Ladewig, Silva H. & Jana Bressem (2013). New insights into the medium hand – Discovering structures in gestures on the basis of the four parameters of sign language, Semiotica 197: 203-231. Ladewig, Silva H. (2011). Putting the cyclic gesture on a cognitive basis. CogniTextes 6. Ladewig, Silva H. (2010). Beschreiben, suchen und auffordern–Varianten einer rekurrenten Geste, Zeitschrift für Sprache und Literatur 41:1, 89-111. Ladewig, Silva H. (forthcoming). Integrating Gestures – cognitive grammar multimodal (ch. 5). De Gruyter Mouton (Series Applications of Cognitive Linguistics (ACL)). Ladewig, Silva H. & Lena Hotze (forthcoming). Erzählen als dynamischer multimodaler Prozess. In: Zima, Elisabeth & Clarissa Weiß (eds). Multimodales Erzählen. Müller, Cornelia & Silva H. Ladewig (2013). Metaphors for sensorimotor experiences. Gestures as embodied and dynamic conceptualizations of balance in dance lessons. In: Borkent, Mike, Barbara Dancygier, and Jennifer Hinnell (eds.) Language and the Creative Mind. Stanford: CSLI, 295-324. Kolter, Astrid, Silva H. Ladewig, Michela Summa, Sabine Koch, Thomas Fuchs & Cornelia Müller (2012). Body memory and the emergence of metaphor in movement and speech. An interdisciplinary case study. In: Koch, Sabine, Thomas Fuchs & Cornelia Müller (Eds.) Body Memory, Metaphor, and Movement. Amsterdam & Philadelphia: John Benjamins, 201-226. Hotze, Lena & Silva H. Ladewig (in preparation). Spreche und Gestik. In: Michael Elmentaler & Oliver Niebuhr (eds.) An den Rändern der Sprache (Kieler Forschungen zur Sprachwissenschaft). Peter Lang. Ladewig, Silva H. (forthcoming). Integrating Gestures – cognitive grammar multimodal. De Gruyter Mouton (Series “Applications of Cognitive Linguistics” (ACL)). Ladewig, Silva H. & Jana Bressem (2013). The notation of gesture phases – a linguistic perspective. In: Cornelia Müller, Alan Cienki, Ellen Fricke, Silva H. Ladewig, David McNeill and Sedinha Teßendorf (eds. ), Body-Language-Communication: An International Handbook on Multimodality in Human Interaction. (Handbooks of Linguistics and Communication Science 38.1.) Berlin, Boston: De Gruyter Mouton, 1060- 1078. Bressem, Jana, Silva H. Ladewig und Cornelia Müller (2013). A linguistic annotation system for gestures. In: Müller, Cornelia, Alan Cienki, Ellen Fricke, Silva H. Ladewig, David McNeill and Sedinha Teßendorf (eds. ), Body-Language-Communication: An International Handbook on Multimodality in Human Interaction. (Handbooks of Linguistics and Communication Science 38.1.) Berlin, Boston: De Gruyter Mouton, 1094-1124. Müller, Cornelia, Jana Bressem und Silva H. Ladewig (2013). Towards a grammar of gesture – a form based view. In: Müller, Cornelia, Alan Cienki, Ellen Fricke, Silva H. Ladewig, David McNeill and Sedinha Teßendorf (eds. ), Body-Language-Communication: An International Handbook on Multimodality in Human Interaction. (Handbooks of Linguistics and Communication Science 38.1.) Berlin, Boston: De Gruyter Mouton, 707-733. Müller, Cornelia, Silva H. Ladewig und Jana Bressem (2013). Gesture and speech from a linguistic point of view – A new fiel and its history. In: Müller, Cornelia, Alan Cienki, Ellen Fricke, Silva H. Ladewig, David McNeill and Sedinha Teßendorf (eds. ), Body-Language-Communication: An International Handbook on Multimodality in Human Interaction. (Handbooks of Linguistics and Communication Science 38.1.) Berlin, Boston: De Gruyter Mouton, 55-81. Bressem, Jana & Silva H. Ladewig (2011). Rethinking gesture phases – articulatory features of gestural movement?, Semiotica 184:1/4, 53-91. Müller, Cornelia, Jana Bressem & Silva H. Ladewig (forthcoming). Gesture and Language (Textbook), Routledge. Cornelia Müller, Alan Cienki, Ellen Fricke, Silva H. Ladewig, David McNeill & Jana Bressem (Eds.) (2014). Body-Language-Communication: An International Handbook on Multimodality in Human Interaction. Handbücher zur Sprach- und Kommunikationswissenschaft / Handbooks of Linguistics and Communication Science (HSK) 38/2 Berlin, Boston: De Gruyter: Mouton. Cornelia Müller, Alan Cienki, Ellen Fricke, Silva H. Ladewig, David McNeill & Sedinha Tessendorf (Eds.) (2013). Body-Language-Communication: An International Handbook on Multimodality in Human Interaction. Handbücher zur Sprach- und Kommunikationswissenschaft / Handbooks of Linguistics and Communication Science (HSK) 38/1 Berlin, Boston: De Gruyter: Mouton. Ladewig, Silva H. (forthcoming). Gestures as part of language – The field of modern gesture studies. In: Moike Jessen, Johan Bloomberg & Jörg Roche (eds.) Cognitive Linguistics. Ladewig, Silva H. (forthcoming) Gestural meaning. In: Moike Jessen, Johan Bloomberg & Jörg Roche (eds.) Cognitive Linguistics. Ladewig, Silva H., Franziska Boll & Lena Hotze (in preparation). How discourse shapes the understanding of gesture. Bressem Jana, Silva H. Ladewig & Cornelia Müller (2018). Ways of expressing action in multimodal narrations – The semiotic complexity of character viewpoint depictions. In: Anika Hübl und Markus Steinbach (eds.) Linguistic Foundations of Narration in Spoken and Sign Languages. Amsterdam: Benjamins. Ladewig, Silva H. (2014). Recurrent gestures. In: Cornelia Müller, Alan Cienki, Ellen Fricke, Silva H. Ladewig, David McNeill & Jana Bressem (eds. ), Body-Language-Communication: An International Hand- book on Multimodality in Human Interaction. (Handbooks of Linguistics and Communication Science 38.2.) Berlin, Boston: De Gruyter: Mouton, 1558- 1575. Ladewig, Silva H. (2014). The cyclic gesture. In: Cornelia Müller, Alan Cienki, Ellen Fricke, Silva H. Ladewig, David McNeill & Jana Bressem (eds. ), Body-Language-Communication: An International Hand- book on Multimodality in Human Interaction. (Handbooks of Linguistics and Communication Science 38.2.) Berlin, Boston: De Gruyter: Mouton, 1605- 1618. Ladewig, Silva H. & Jana Bressem (2009). Review: Ulrike Bohle, Das Wort ergreifen – das Wort übergeben. Explorative Studie zur Rolle redebegleitender Gesten in der Organisation des Sprecherwechsels. Berlin: Weidler Verlag 2007 In: Gesprächsforschung- Online-Zeitschrift zur verbalen Interaktion. 10, 1-11. Ladewig, Silva H. & Paul Kramer (2016). Andere Länder, andere Gesten, published at the website of„Haus der kleinen Forscher“. Ladewig, Silva H., Franziska Boll, Dorothea Horst, Lena Hotze, Benjamin Marienfeld & Larissa Rombold (2016). Bedeutung (be)greifen. Metapher in gesprochener Sprache und Geste. Veröffentlicht im Rahmen der Sonderausstellung „Sprache“ im Deutschen Hygienemuseum Dresden. Disclaimer: The content of link pages is the sole responsibility of the individual operators.